I had big plans for the labor day weekend. I first planned to take a little camping trip upstate to relax and unwind but first the hurricane nixed those plans and then my family used my free weekend to request my help with moving. They promised it would only be one day and then I could have the rest of the weekend to myself. So I suffered the loss of my Saturday (prepacking) and Sunday (actual moving day) with hopes of seeing the West Indian Day parade on Monday with my son. 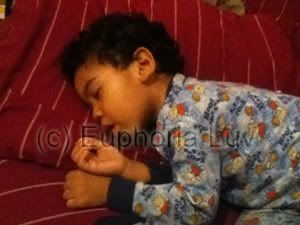 But on Monday morning my son woke up with a fever and refused to get out of bed. He slept for most of the day but did wake now and then for a cuddle. I worried that the fever would turn into something serious but so far it was low grade with no other serious effects. Around 4pm he woke up and seemed better so I tried giving him something to eat and drink. He nibbled, drank and sat down in front of the pc to watch cartoons. I took a few moments to try and work on a project a few feet away. As I furious typed away I heard the wet sound of something dripping. As I looked over to where my son was sitting I saw a large pile of slimy vomit spreading from the keyboard and dripping down from the table. Plop, plop. I checked my son to make sure he was ok. No crying or mention of the vomit. He just looked at me and then looked at the mess that was his lunch. *sigh* After a very through cleanup, I changed his clothing, restarted the cartoons and went to finish what I was working on. A few minutes later, my son was ready for another around of napping and I was ready to join him. Our labor day didn't turn out as we planned but in the long run it was for the best. I heard later that night that there was not one but two shooting incidents during the parade. I can't imagine what it would have been like to be running with my son as bullets flew around me. As I compare what my day was versus what it could have been, I decide that I can live with vomit on the key board and my son laying peacefully next to me. OMG that's right. I heard on the news about numerous shootings. Good thing he was sick - you stood home safe and sound. Hope he's feeling better. Yes, it was a blessing in disguise that you both didn't make the parade given all the shootings that took place. Though your DS was sick, he perhaps saved you both from something worse. Hope he is feeling better soon! Anyhoo, I hope Daniel is feeling better now! Too bad I am just now catching up on this post, I would have checked in with you today when i saw you. Poor baby! Hello and Welcome. 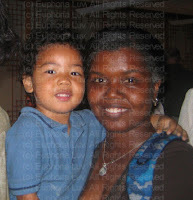 My name is Nikki and I'm mommy to Daniel, who's Black West Indian and South Korean aka Blasian. I'm also Owner of the Mixed Family Life/Asian Black Community/Euphoria Luv blog, online support group and profiles. Welcome to the Mixed Family Life blog. This blog features information and resources for the Asian and Black (Blasian) and Mixed Race Community.